A group of neighbors met Sunday to identify illegal dump sites around Kessler Park. KANSAS CITY, Mo. — Just six days into the new year, 311 data shows there have been more than 60 calls to the city complaining about illegal dumping. In the historic Northeast, neighbors are taking matters into their own hands. A group spent Sunday afternoon surveying the woods of Kessler Park, documenting illegal dump sites and abandoned campsites. "What we're trying to do today is just find some more locations that need attention, and here's one of them," Pendleton Heights resident John Bordeau said of a clearing just off a trail. 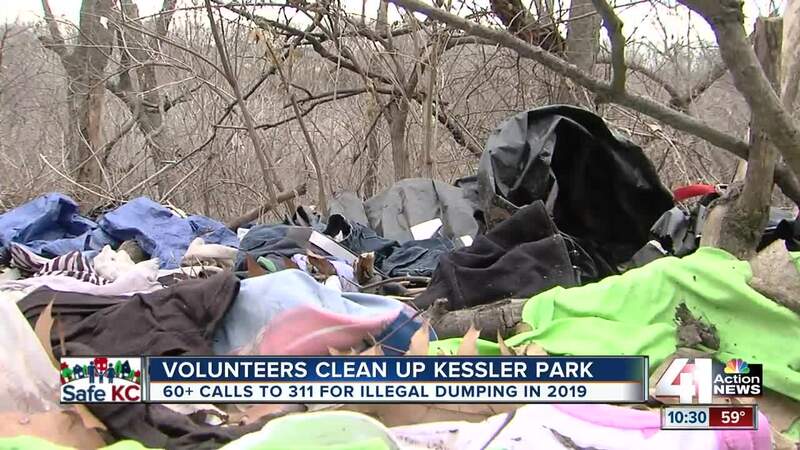 The kinds of things neighbors have found around Kessler aren't for the faint of heart — it was littered with tarps, blankets, clothes and other miscellaneous items. "We found drug paraphenalia, needles, uh, human waste — all the bad things you would never want to run into on a hike or in a park," said Michael Stringer, a community activist from Scarritt Renaissance. Thirty volunteers who live in the area filled two dumpsters with trash Thursday, but there's no shortage of sites remained to be tackled by volunteers. "It's way more than just a little group of people can do," Bordeau said. As the city reinstates its park ranger program, Bordeau and others hope one will be stationed at Kessler Park to prevent people from trashing it in the first place. "If there was a park ranger on duty with an emblem on the side of the truck, people would think twice before doing all that," Bordeau said. In the meantime, neighbors will continue their work. "That's why I love northeast Kansas City," Stringer said, "everyone is really committed to making sure that we end this problem or at least try to clean up as much as possible." Volunteers plan to report the sites to the city and Aanother clean up already is scheduled for 10 a.m. on Saturday, Jan. 12. You can follow their work here .